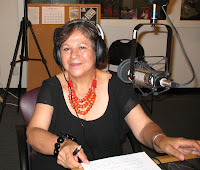 Peruvian social psychologist Cristina Herencia on Rag Radio, Friday, June 29, 2012. Video by Jeff Zavala of ZGraphix who filmed the show live at the KOOP studios in Austin. Peruvian social psychologist Cristina Herencia discussed the effect of globalization on the world's indigenous peoples with Thorne Dreyer on Rag Radio, Friday, June 29, 2012. Rag Radio features hour-long in-depth interviews and discussion about issues of progressive politics, culture, and history. The syndicated show is produced in the studios of KOOP-FM, Austin's cooperatively-run all-volunteer community radio station. It is broadcast live on KOOP and streamed live on the Internet, and is rebroadcast on Sunday mornings on WFTE-FM in Mt. Cobb and Scranton, PA.
On the show Herencia, who works in interdisciplinary social sciences with a specialty in the study of indigenous peoples, discusses the effect of globalization and the spread of global capitalism on native peoples, especially in the Americas. She also addresses the historical -- and continuing -- injustices committed against native peoples; the reemergence of indigenous peoples' movements on the public scene and the role of the United Nations in providing them with a forum; and what she believes the non-patriarchial, egalitarian, earth-rooted Indian cultures have to offer a contemporary world in crisis. Herencia, who has been teaching introductory sociology at Austin Community College, has a Masters in Experimental Psychology from the State University of New York (SUNY) and a Ph.D in Latin American Studies from the University of Texas at Austin. Her primary research deals with social identity in Native Andean peoples and cultures, especially in relation to gender, and the impact of globalization on their lives. She has presented talks and papers in the United States and in Chile, Peru, Venezuela, Puerto Rico, Costa Rica, Peru, and Spain -- and in Havana and Paris. She attended the 1992 Columbus Quincentennial Commemoration and for the last nine years has participated in United Nations forums on indigenous peoples. Rag Radio has aired since September 2009 on KOOP 91.7-FM in Austin. Hosted and produced by Rag Blog editor and long-time alternative journalist Thorne Dreyer, a pioneer of the Sixties underground press movement, Rag Radio is broadcast every Friday from 2-3 p.m. (CST) on KOOP, 91.7-fM in Austin, and is rebroadcast on Sundays at 10 a.m. (EST) on WFTE, 90.3-FM in Mt. Cobb, PA, and 105.7-FM in Scranton, PA.
Coming up on Rag Radio: THIS FRIDAY, July 6, 2012, Maria Elena Martinez and Luz Bazan Gutierrez examine the legacy of the historic Raza Unida Party of the 1970s.